What’s almost as good as a list of 70 Elf on the Shelf ideas? A list of 26 Elf on the Shelf printables. That’s right!! I have found everything from games to play with those little ones to a fun elf size photo booth! These printables are fun and bright and sure to make those kiddos of your love that little elf even more. I just love the fun our little elf brings out in me too. I wish I had one of these little guys when I was younger. Check out the list below and let me know which one of these is your favorite free printable. 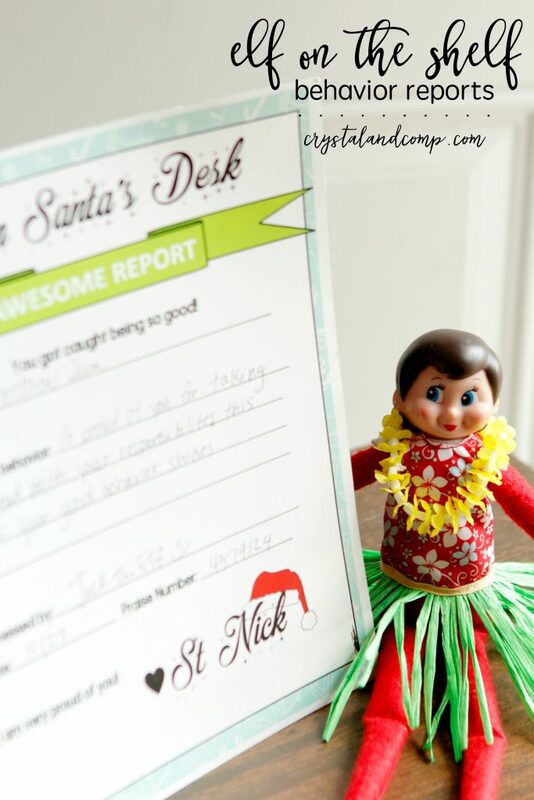 Elf on the Shelf Counting Worksheet– I love this idea too!! Anything to get my kids counting is a plus. Even your Elf can get them into school. Elf Photo Booth Props– Print, glue them to a slim wooden rod (or screwer) and set up your Elf. Includes backgrounds, beard, mustache, kissing lips, top hat and more! So cute! Notes From Elf– If your kiddos are anything like mine, they know my hand writing. So having these printables from your elf keeps those smart kiddos from figuring out who is really writing these notes. North Pole Breakfast– Have Elf bring breakfast! This pack includes welcome sign, invitations, cupcake toppers and more! Elf Do a Dot Printables– This printable is designed for the younger kids. Perfect for fine motor skill building and lots of fun! Lunchbox Notes– I have always loved sending notes in my kid’s lunches. Now your little Elf can join in on the fun as well. Elf Banner– This Elf banner is too cute. Love the way she hangs it. There are also cupcake printables and naughty or nice printables. Magic Elf Key– This is such a great idea. You are giving your elf a magic key to your front door. Plus there is a free printable. Elf Christmas Reading Flashcards– these are epic and a great way to make learning fun! Elf on the Shelf Activity Printables– These cute tags are random fun notes. There are also joke printables, as well as question note cards to get your kiddos thinking about Christmas time. Hersey Kiss Printables– Hersey Kisses are popular with Elf because its his way to give kisses to your kiddos. These are such cute printables to add some extra craftiness. K-2nd Grade Printables– These activities are for kids in kinder through second. You have word scrambles, puzzles, addition and subtraction, coin matching, and word searches. Santa Letter– Santa letters are always a fun way for the big guy to communicate to your little one. Note Cards from Elf– These again are super cute and fun. Different design and you can add your own text. Elf Kissing Booth Printable– This is by far my favorite I think. Such a cute little elf giving out kisses. Magic Elf Dust– Anything that my kids can do during the holidays is fun. They will LOVE this Elf dust and the printable. Elf Poo Printable– Elf poo is funny and even makes for a great treat bag for those younger kiddos. 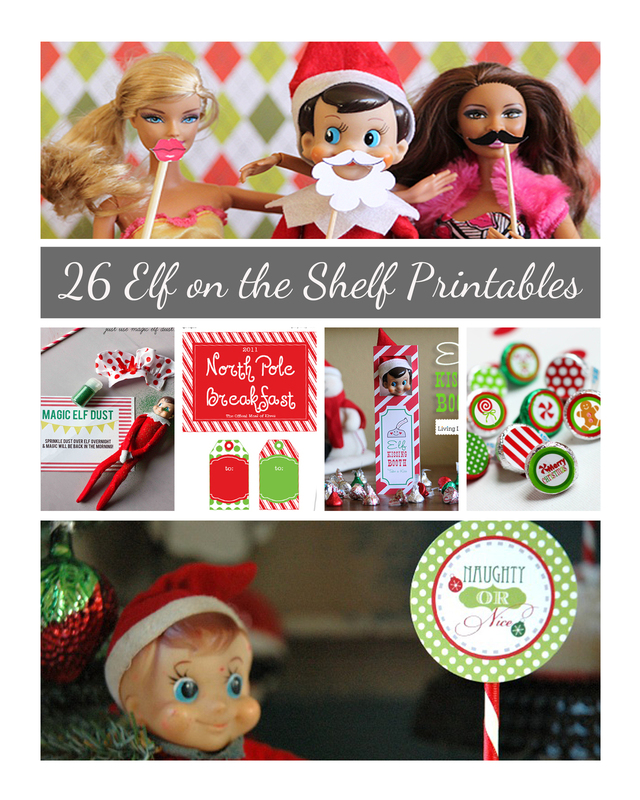 Elf on the Shelf Household Printables– This is the coolest pack! 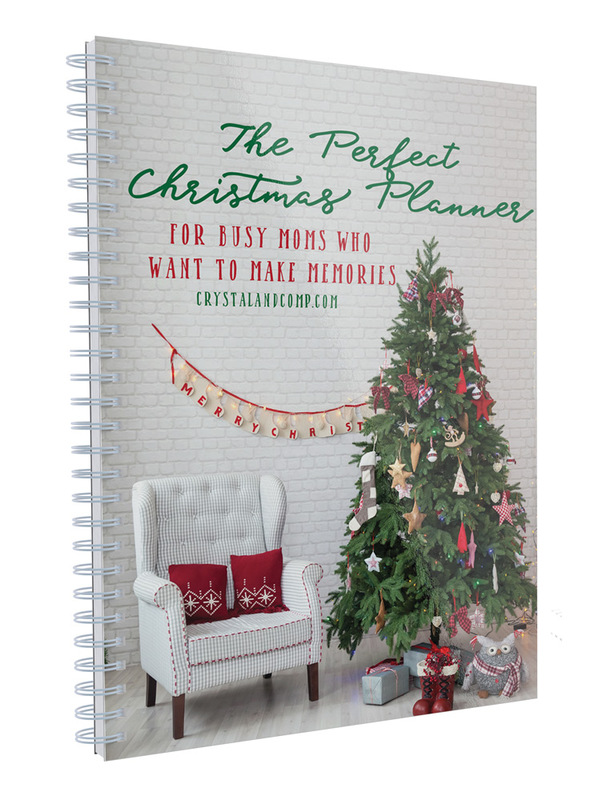 You get an elf menu,task list and planner! You will feel so festive with this! Welcome Breakfast– These printables are Naughty and Nice printables and so very cute!! Snowflakes and all. 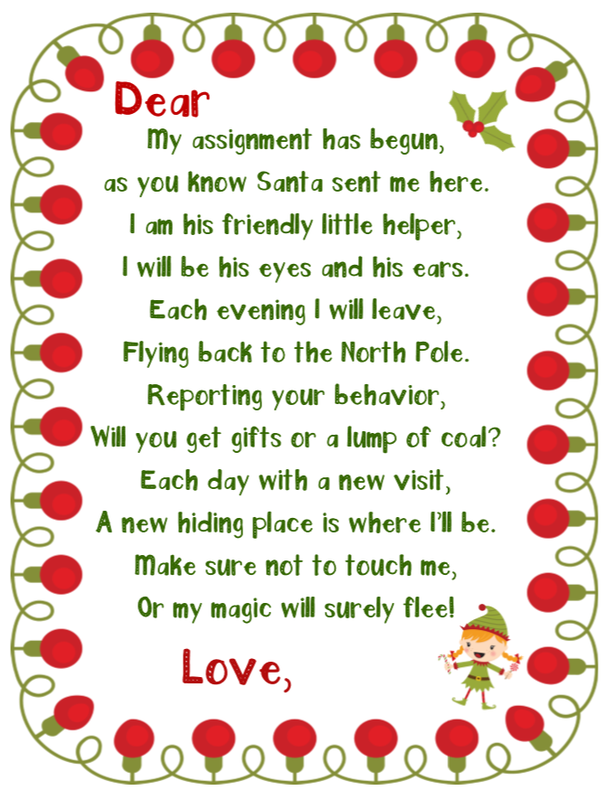 Elf Letter– This is an elf-sized printable. I just love the little elf shoes at the top of this printable. Elf Size Photo Booth Props– Let your elf have a photo booth party and these free printables will be a hit for sure! Elf Stationery Set– Give your kiddos a special message from the north pole. Elf Writing Paper– You can use this idea to help get your kiddos to enjoy writing. Good for homeschooling as well. Your elf can use these with is messy handwriting to practice as well. Lunch Box Notes– Again this a super cute idea for your kiddos lunch boxes!! Some have jokes or just funny sayings. 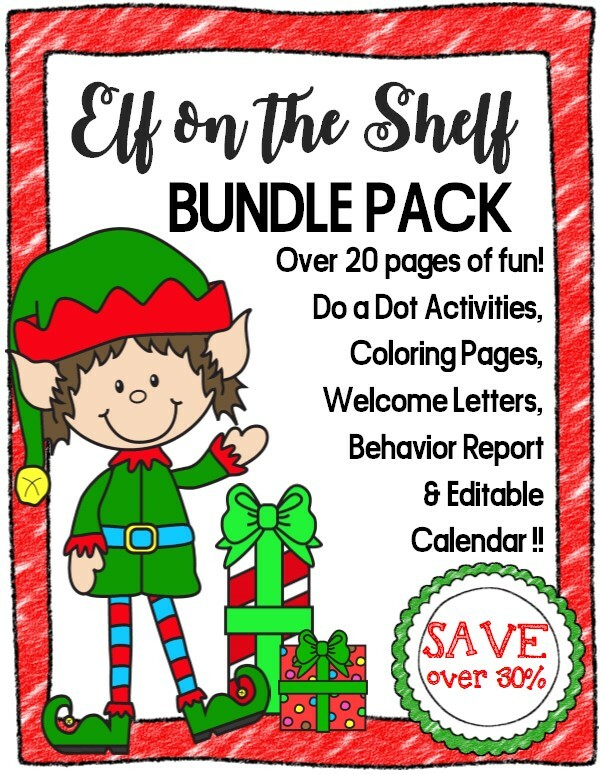 Elf Printable Package– This has more than 60 pages of free printables. Anything from puzzles, coloring, matching and helping your little ones with sounds. So fun! Recovery Kit– If you happen to touch your Elf on the Shelf (or your kiddos do) you can simple print out this recovery kit. This is too cute! Looking for easy Elf on the Shelf ideas? You will love these done-for-you, print and go ideas! And here is our Elf on the Shelf Welcome Letter. Just plug in your elf’s name and your child’s name. They will be so surprised! 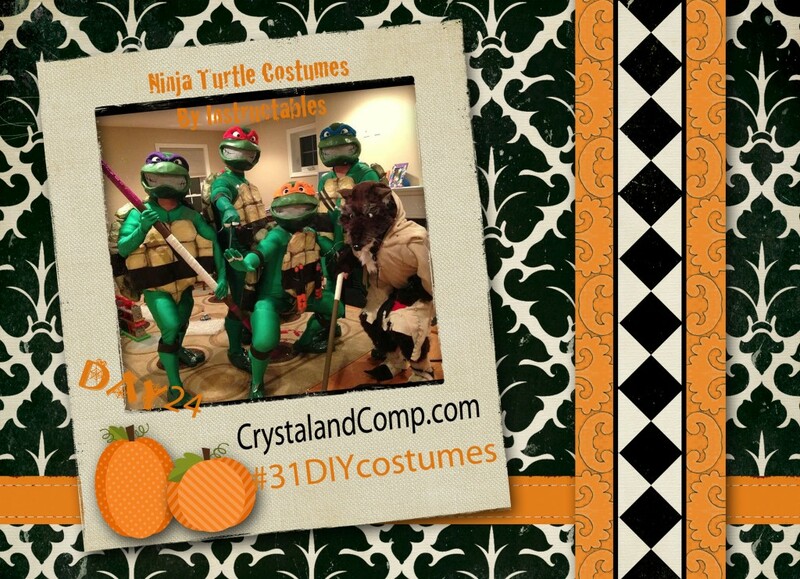 Its finally day 31 at Crystal and Comp and we are going to be wrapping up our DIY Halloween Costumes!! I think I have saved the best for last!! Today I am showing you all a tutorial on how to make a Rag Doll Halloween costume. This costume idea is a mother/daughter Halloween costume, but you could always just make one or the other. I LOVE the red yarn hair. The outfits they have on really add to the costume as well. The hair is pretty simple, really. You need a lot of red yarn, or whichever color you might choose, felt strips, scissors, embroidery floss (or thread) and 2 hair combs for each wig you are making. I found this tutorial over at A Beautiful Mess. The idea could also be used for so many other costumes and it really is one of a kind. Totally cute huh? I love it. I am sure my sister-in-law Crystal would love to dress up as this for Halloween this year. Right Crystal? 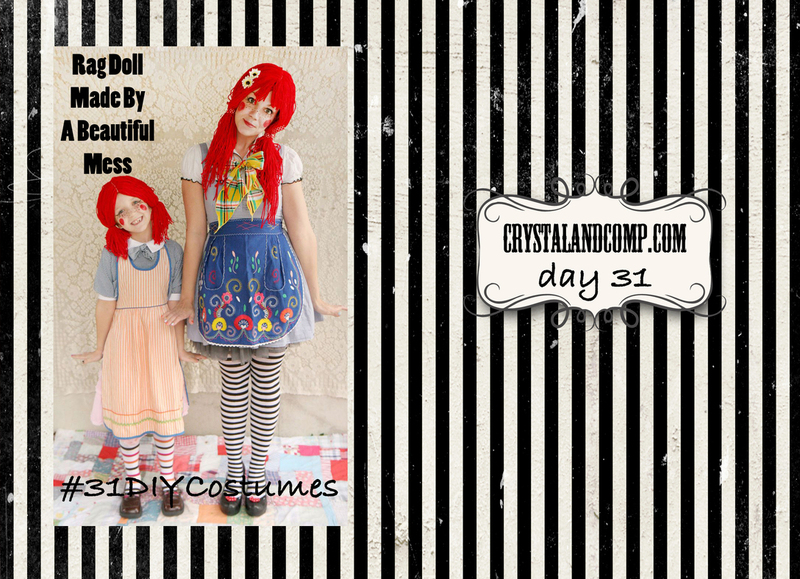 Head over here to see this tutorial on how to make a Rag Doll Halloween Costume. As always do not forget to Pin this idea to your Pinterest board. 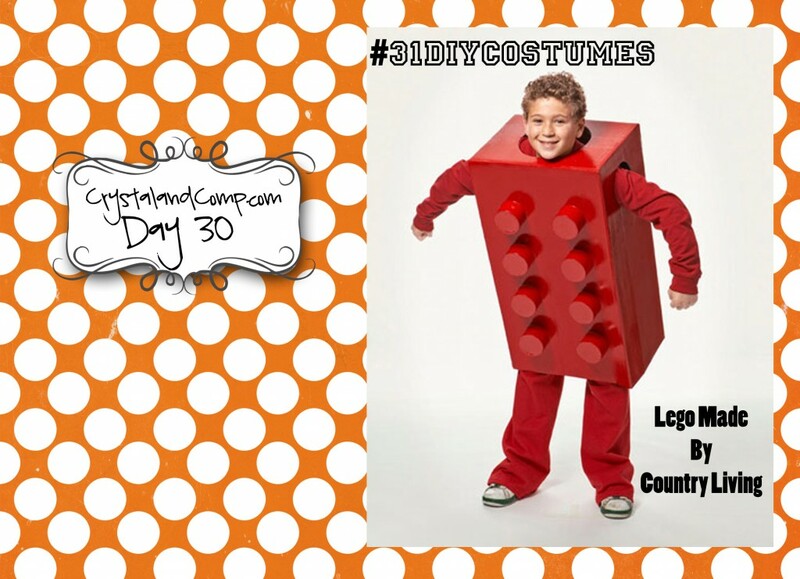 Today is day 30 and I have found a super cute Lego costume for you all to check out. I love this idea because what kid does not just LOVE legos? I used to play with these as a kid and find myself still enjoying putting them together with my kiddos. This tutorial I found over at Country Living and it is so simple. All you need for this costume idea is a large cardboard box, eight round craft boxes and whichever color spray paint you choose. DIY Halloween costumes are so much fun because you can make them yourself choosing inexpensive materials. All of these things can be found around your home, or from someones leftovers. This Halloween costume will seriously cost you nothing hardly, if anything. If several kiddos dressed up as Lego’s you could have several different colors as well. There are even pink Lego’s these days. See what I mean about this little Lego costume? Too cute, right?!?! Head on over here to see the full tutorial of this Lego Costume. Its very simple!! Also, do not forget to pin this to your Pinterest board for easy keeping. You could really use this costume for many other things in the future. Can you believe it is already day 29 over here at Crystal and Comp? We only have two more costumes to share with you guys and then you get to start making those awesome DIY Halloween Costumes. This next costume is so fun. It is one of my favorite candies this time of the year and hopefully your too. 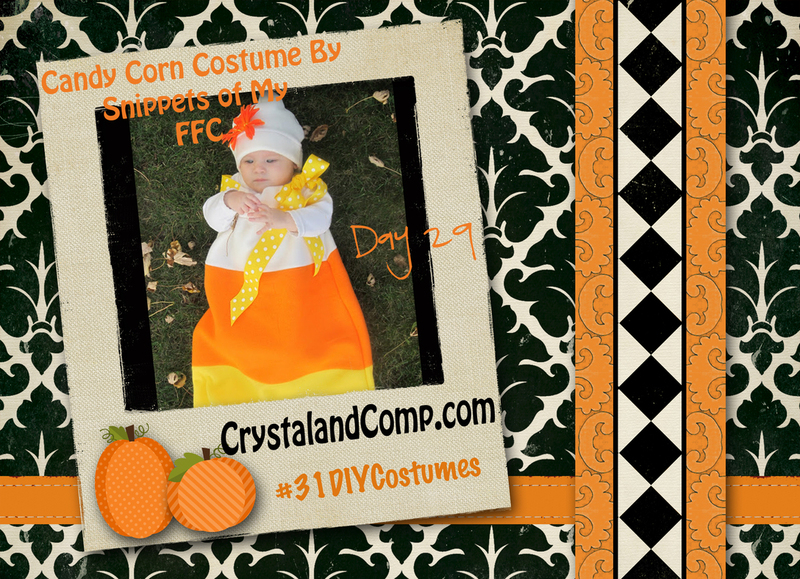 Today we are talking about a Candy Corn tutorial I found over at Snippets of My Family, Faith and Crafting. This tutorial does require some sewing skills, but do not worry because she has a great tutorial showing you exactly what you should be doing. This costume is made for a little baby girl, but you could totally change this into a dress for an older girl to wear. I just love the bow at the top of the dress. It really adds to the outfit. Now doesn’t this costume make you want to eat some candy corn? It makes me want to!! Head over here to see this full tutorial on how to make a Candy Corn Halloween Costume. While you are here do not forget to pin this to your Pinterest board for easy keeping. Its day 28 and today I have found a Halloween costume that is great for those older kiddos as well as the younger kiddos. I think its harder to find cute costumes as the kids get older. Many of the costumes now for older kids are just scary and not cute. Like other DIY Halloween costumes this tutorial I have found is complete from head to toe. This mad scientist tutorial comes with brains and all. You can make the brains looks bloody or not. Which ever you or your child prefer. The brains are actually the hardest part to this costume and would make a great science experiment while you guys are at it. I found the mad scientist costume over at Lisa Storms and the brain tutorial over at Paper, Plate, and Plane!! See what I am telling you about with that brain? Cool science experiment for those homeschoolers or just people who LOVE science, like myself. 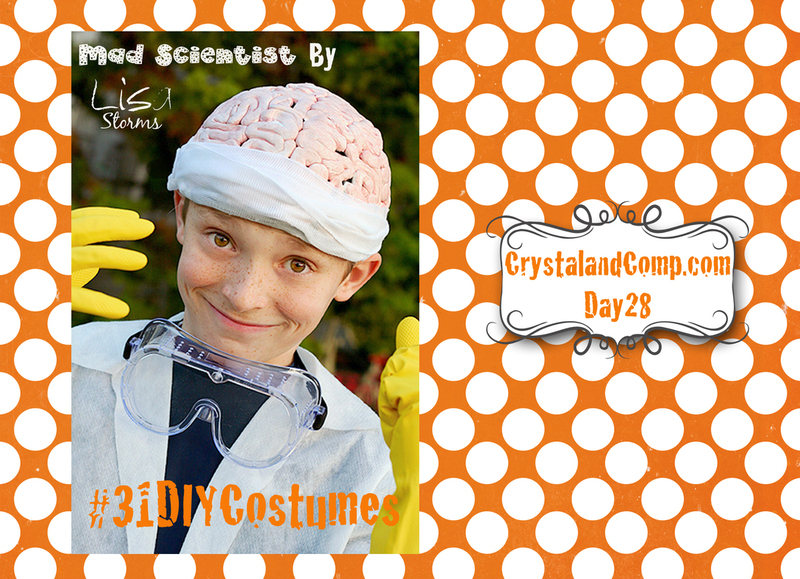 Click here to see the full mad scientist costume idea and click here for the brain tutorial. As always do not forget to pin this to your Pinterest board for easy finding when you are ready. Little girl costumes are just too cute. Add some feather and some orange tights and this little peacock will be so adorable. On day 27 we are talking about a cute, little blue peacock. The feathers I think really add to this costume idea and the orange tights give the look of real peacock legs. Like other DIY Halloween costumes you can find many of these supplies around your own home. By doing this you can really cut the price of the costume down. Many families go out and spend over $100 at Halloween time on multiple costumes. So what better way to just make your own? I found this cute tutorial over at Creatively Christy and many of the supplies she bought and then just put all of the pieces together. See, what do you all think? I just love all of the finishing touches she put with this costume idea. Do not forget to head over to Pinterest and pin this idea to your Halloween board for easy keeping. And head over here to see the full Peacock tutorial you wont want to miss. 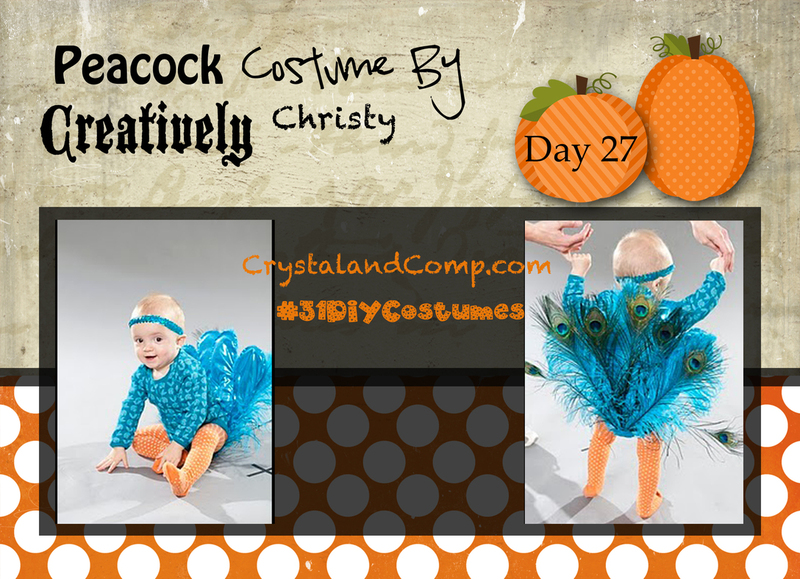 Its day 26 of DIY Halloween Costumes over at Crystal and Comp. Today I am going to be showing you guys a costume that has been around forever. Super Hero Mario Brothers have been around since I was little and I can remember playing this game for hours on end. I loved them and still do. My cousin and I used to play this game and crack up laughing. So much fun. Nowadays, Super Mario Brothers are just as popular as they were when I was a kiddo. My kids love playing their games just as much as I do… I mean did (well maybe still do)! This tutorial is fairly simple and may require some sewing. The costume is made out of felt and you just need various colors. The creator also has tutorials for the popular boxes that have the coins in them. She uses these as their treat boxes. What a fun idea, huh? I found this idea over at The Russo Corner and you won’t want to miss it! Now don’t these Mario Brothers guys make you want to go play the game again? I just love this game. Such a fun childhood memory. 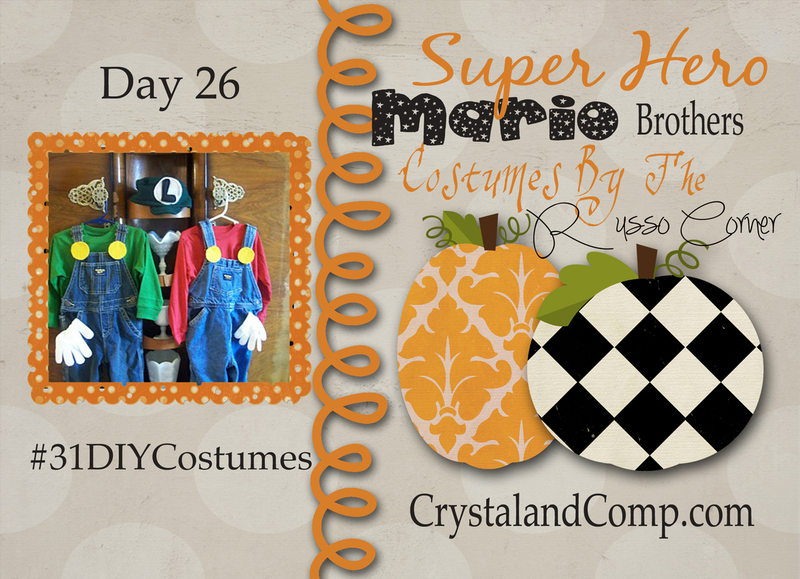 Click here to see the full tutorial of the Super Hero Mario Brothers boys!! Do not forget to head over to Pinterest to pin this idea for easy keeping. You wont want to forget about this costume idea. Okay, I seriously have a soft spot for Halloween costumes that are themed and today is no different. On day 25 we are talking about the Wizard of Oz Halloween costumes. 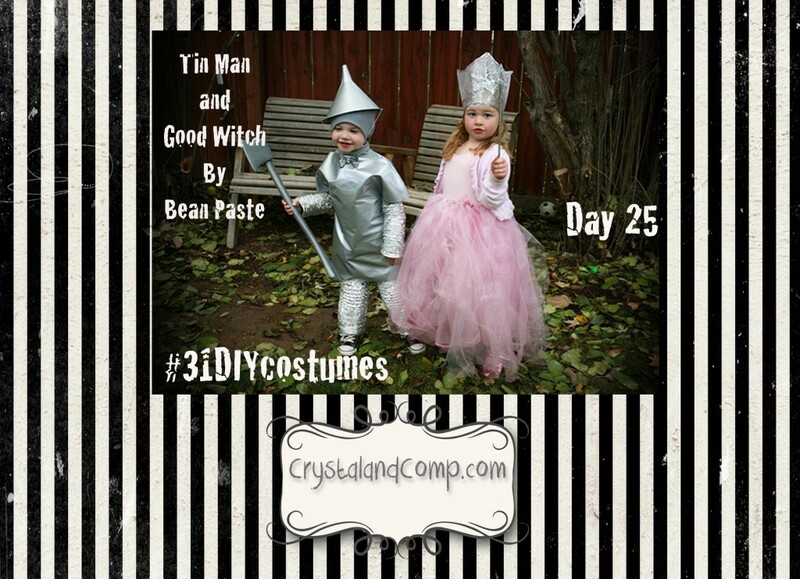 This tutorial is focused on the Tin Man and Glinda, the good witch. Glinda is a no-sew tutu costume idea with some accessories added to her. The Tin Man, well he is just so stinkin cute with all of his metal-looking attire on. His legs are made of 3″ dryer vent material, which really gives the costume character. DIY Halloween Costumes like these make Halloween so fun. I found this idea over at Bean Paste and there are even tutorials for the Lollipop Munchkin and the Cowardly Lion. So, you can send several trick-or-treaters out with Wizard of Oz inspired characters. See what I am talking about with this super cute Halloween costume idea? Tin Man is by far my favorite, but you should head over here to see the full tutorial on the Wizard of Oz Characters. You wont want to miss these. As always please pin these to your Pinterest board for easy keeping while you are here. 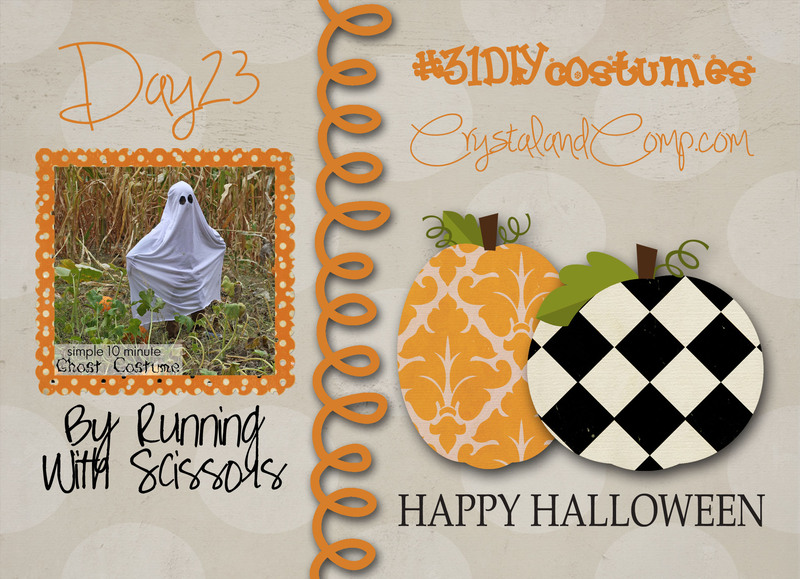 Its day 23 and Halloween would not be the same without seeing a ghost costume running around. That’s right, today we are going to talk about a ghost costume and its pretty easy too. DIY Halloween costumes rock because they are unique and different and this little ghost is just that. I found this tutorial over at Running With Scissors and her tutorial takes simply 10 minutes tops. WOW… you cannot beat that! Seriously!! I love the eyes in this costume. They are actually made with some left over lace fabric she had, but you could use anything really as long as you can see through it. This little ghost would scary me walking down the street at night, but hey…. I am a little chicken when it comes to scary stuff. See what I am talking about with this little ghost being one scary little guy? But I think he could be made cute too!! Head on over here to see this easy ghost costume being made. Its simple, fast and cheap and you wont want to miss it. Do not forget to pin this to your Pinterest board as well for easy keeping.